This update includes some functional improvements of support for the latest Outlook editions. Several other problems were fixed as well. After beta testing our first Release of ReplyWith version 1.0.6 finally available for downloading. You will love this product! 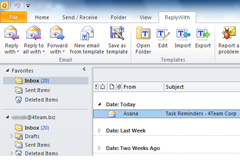 Beta Release of ReplyWith v1.0.1 available for download from outlook4team.com.